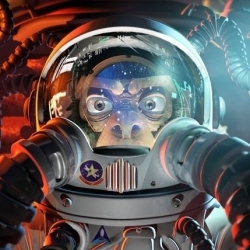 A monkey is casually enjoying his banana in the jungle when he suddenly gets captured and thrown into space. MonkeyMoon! by Eric Villeneuve, Antoine Rouleau, and Emmanuel Gatera.